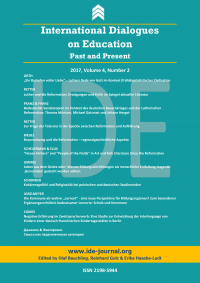 IDE publishes thematically connected issues as well as others in which the title of the journal provides the sole orientation for the examination of educational events from historical, international and comparative perspectives. In this current issue you will find a mix of thematically oriented and thematically open contributions. The former refers to the 500th anniversary of the Protestant Reformation and aspects of contemporary reflections on this event. Over time, different worldviews have engaged with the educational and political legacy of the Reformation. With regard to these contributions, our journal does not favour any particular religious or secular, theoretical-scientific or research-method orientations. We support the position that the 500th year of the Reformation has not been declared as a jubilee inside Protestant circles and is not meant to be centered on Luther only (Käßmann, 2016). The Reformation was one of the world’ s largest historical transformation processes and has been depicted from different points of view, religious and non-religious, ecumenical and secular, with and without attempts at proselytization. In addition to Luther, Phillip Melanchthon (1497-1560), the „Praeceptor Germaniae“, needs to be mentioned. Outside Germany in particular, his prominent significance for the Reformation and its ensuing developments in the education sector are not well known. Although we cannot claim to make a special contribution to a proper consideration of Melanchthon with this issue, we hope to do more so within the framework of one of the upcoming issues. The Reformation provides a worthwhile example for exploring to what extent one can learn from history. Can discussions about the leading representatives of the Reformation and the reforms they initiated as well as their misconceptions and attitudes towards other Christian movements as well as non-Christian faith communities (for example, Jews) be useful for a deeper understanding of current problems and their solutions? It is important to know as much as possible about history in order to gain a perspective beyond the effect of the current moment (Diesterweg, 1956, p. 205). In other words: “Those who can not remember the past are condemned to repeat it.” (Santayana, 1905, p. 284) Historical knowledge can help overcome the compulsion to repeat evil, develop empathy toward people from other cultures and religious identities and surmount ethnocentric views. The first part of this issue is introduced with a contribution by Gottfried Orth on Luther’s speech on God at the time of (early) capitalist civilization. For example, the author outlines Luther’s deliberations in this context and calls for contemporary critical social perspectives on capitalism as well as understandings of god in the vein of Luther’s theology, which can support current faith orientations in their engagement with economic and social developments. Hein Retter analyzes selected publications on Luther and the Reformation with particular attention to current views of Martin Luther by historians, church historians and literary authors. He concentrates on their representations of Luther in the context of his roots in the Middle Ages, the outstanding accomplishments of the Reformation in words and images, critiques of Luther from a post-Christian perspective, and the future of churches. In his contribution, Gerd Biegel shows an example of how the Reformation was a very heterogeneous movement, with different regional and local manifestations and developments. He highlights names such as Johannes Bugenhagen (1485-1558), Gottschalk Kruse (1499-1540), or Heinrich Lampe (1503-1583), who are little known today but without whose activities the Reformation was hardly conceivable in the city of Braunschweig in 1528. Anja Franz & Dietrich-Eckhard Franz describe significant social utopias in the context of the German Peasants’ War and the Lutheran Reformation. They focus on Thomas Müntzer (ca. 1489-1525), Michael Gaismair (1490-1532) und Johann Hergot (ca. 1522-1527). The authors claim that Martin Luther’s 95 theses initiated the Reformation, but that Müntzer and other utopians spread the Reformation to all levels of society. Many of their society- and utopia-focused critiques pointed far beyond the then existing social conditions in their declarations and demands. The focus of another contribution by Hein Retter is the question of tolerance and intolerance in the epoch between the Reformation and Enlightenment and in the context of the Catholic-Protestant schism. The results from an international conference presented here show that tolerance in the age of the Reformation cannot be confused with the mutual recognition of religious and cultural idiosyncracies when advocating for a peaceful coexistence of different groups in a pluralistic society. With their arts- and literary-historical essay, Richard D. Scheuerman & Arthur K. Ellis bring a new thematic direction and, through the use of images, a visual enrichment to our journal. The authors deal with the portrayal of “House Fathers” and “People of the Fields” in the arts and folk literature since the Reformation. In early-modern German and Austrian arts and literature, humans’ relationship to nature in the context of the technological changes caused by the Industrial Revolution was often connected with ideas of the Protestant Reformation. A sustained engagement with nature was already one of the concerns of these nineteenth-century artists and literary authors. Renate Girmes explicates why educational institutions should be considered „communities“ for human development. The author explores arguments for a new view on the tasks of the education system from a tradition of Christian thought and in this context discusses the sense and promise of baptism in its argument for the endorsement of the Gospel of John. A way of reading in this tradition is also developed, revealing what foundational information on the nature of intergenerational relationships can be found in the biblical text, and what connected challenges a professional education and learning practice faces. The contribution of Malgorzata Schonder builds a certain thematic bridge between the first and second parts of this issue. The author’s study makes an empirical contribution to the question on whether there is a differnece in the influence of religious beliefs and affiliation on the sense of coherence and religious beliefs between young people from a secular country (such as Germany) and a Catholic country (such as Poland). Under the term „religousness“ it examined religious beliefs, organized and non-organized religious activities. Herbert Asselmeyer explicates the idea and concept of learning regions, to which school networks make an important contribution, because they are the only type of organization with compulsory enrolment. Learning regions can be a network of potential individual pedagogical institutions, in order to help discover and expand gifts and talents even more effectively. Communities or „communes“ („Gemeinden“) are „the true learning places, for children and adults“. Nadine Comes’ contribution informs about the results of a qualitative study on negative formative experiences in the language acquisition of two- to six-year-old children in a bilingual German-French daycare centre. The author explicates how the investigated „negative experiences“ were related to the existence of a learner’s inner language and aligned with previously defined competence areas. Alexander Y. Daniliuk & Alla A. Faktorovich describe “sense” as a fundamental pedagogical category. The authors analyze different definitions of the concept “sense” by separating it from “meaning” and similar terms. “Sense”, “Smyslosfera” (смыслосфера; sense sphere) constitute the real content of education, which consists of conscious, free activities and which should become a key element of educational content. The authors are aware of the difficulties in adequately translating the terms in the article’s content and are interested in a constructive critical discussion of this terminology. Käßmann [= Кесманн], M. (2016): Reformation und Ökumene – eine Herausforderung. URL: www.ekd.de/vortraege/kaessmann/20160311_kaesmann_reformationsjubilaeum.html (retrieved: June 19, 2016). Santayana, G. (1905): The Life of Reason (…). URL: http://archive.org/details/thelifeofreasono00santuoft (retrieved: June 19, 2016). Authors are requested to follow our Instructions to contributors (!) and to send their articles for issue 3-2017 by August 31, 2017. ИДО издает как тематически связанные номера, так и такие, в которых только название журнала является ориентиром для исследования педагогических явлений с исторической, международной и сравнительной перспективы. В этом номере мы предлагаем микс из тематически ориентированных и тематически открытых вкладов. Первая часть связана с 500-летием протестантской Реформации и аспектами современной рефлексии. В течение времени ученые разных мировоззрений занимались педагогическим и образовательно-политическим наследием Реформации. В отношении подобных статей в нашем журнале не отдается предпочтения специальным религиозным, научно-теоретическим или научно-методическим направлениям. Мы поддерживаем позицию того, что 500-летие Реформации не объявлялась юбилеем внутри протестантского круга и не должно концентрироваться лишь на Лютере. Реформация была одним из крупнейших мировых исторических трансформационных процессов и представлялась с различных точек зрения: религиозной и не религиозной, экуменической и светской, с попытками и без попыток узурпации. В дополнение к Лютеру необходимо упомянуть Филиппа Меланхтона (1497-1560), «PraeceptorGermaniae». Особенно за пределами Германии мало известно его выдающееся значение для Реформации и ее влияние в области образования. Но и в этом номере мы не можем еще уделить соответствующее внимание Меланхтону, однако надеемся сделать это в большей степени в рамках одного из следующих номеров. На примере Реформации можно понять, в какой степени можно учиться из истории. Могут ли дискуссии о ведущих представителях Реформации и инициированных ими реформах, а также их заблуждениях и отношениях к другим христианским движениям или нехристианским сообществам верующих (например, евреям) быть полезными для более глубокого понимания современных проблем и их решения? Речь идет о том, чтобы как можно больше знать об истории, чтобы получить точку зрения о воздействии текущего момента (Дистервег, 1956, стр. 205). Другими словами: «Кто не может вспомнить о прошлом, тот обречен на его повторение» (Сантаяна, 1905, стр. 284). Историческое знание может помочь избежать необходимости повторения зла, развить сопереживание людям других культур и других религиозных воззрений и преодолеть этно-центристские взгляды. Первая часть номера начинается статьей Готфрида Орта о речи Лютера о Боге во времена ранней капиталистической цивилизации. Автор очерчивает, например, размышления Лютера по этому поводу и задает вопрос и задает вопрос о современных общественных, критических по отношению к капитализму перспективах, а также о понимании Бога в направлении теологии Лютера, которое может позитивно сопровождать современные ориентиры веры в полемике с экономическим и общественным развитием. Хейн Реттер анализирует избранные публикации о Лютере и Реформации при особом внимании актуальных позиций историков, историков церкви и писателей. Он концентрируется на изображениях Лютера в связи с его корнями в Средневековье, с выдающимися успехами Реформации в словах и картинах, критикой Лютера с постхристианской и католической точки зрения и будущего церквей. В своей статье Герд Бигель показывает пример того, что Реформация была очень неоднородным движением, с различными региональными и локальными проявлениями и развитиями. Он знакомит с такими именами как Йоханнес Бугенхаген (1485-1558), Готтшальк Крузе (1499-1540) и Генрих Лампе (1503-1583), которые сегодня менее известны, но без деятельности которых, вряд ли, можно представить, например начало Реформации 1528 года в городе Брауншвейг. Аня Франц и Дитрих-Экхард Франц описывают известные социальные утопии в контексте Крестьянской войны и Реформации Лютера. Речь идет о Томасе Мюнцере (прим. 1489-1525), Михаэле Гайсмайре (1490-1532) и Иоганне Герготе (1522-1527). Авторы подчеркивают то, что 95 тезисов Мартина Лютера инициировали Реформацию, но Мюнцер и другие утописты охватили Реформацией все слои общества. Многие из общественно-критических утопических сочинений в своих высказываниях и требованиях выходят далеко за существующие социальные и отношения. В центре внимания другой статьи Хейна Реттера стоит вопрос толерантности и нетерпимости в период между Реформацией и Просвещением, а также в контексте католическо-протестантского раскола. Результаты международной конференции, которые автор представляет, показывают, что нельзя смешивать толерантность в эпоху Реформации со взаимным признанием религиозного и культурного своеобразия, если речь идет о выступлении за мирное сосуществование различных групп в плюралистическом обществе. Статьей, посвященной истории искусства и литературы, Рихард Д. Шойерманн и Артур К. Эллис вводят новое тематическое направление, а иллюстрациями новые цвета в наш журнал. Авторы занимаются изображением «House Fathers» и «People of the Fields» в искусстве и народной литературе со времен Реформации. Отношение людей к природе в контексте технологического преобразования благодаря промышленной революции часто связывалось в немецком и австрийском искусстве и литературе начала нового времени с идеями протестантской Реформации. Устойчивое взаимодействие с природой было уже одной из проблем художников и литературных авторов девятнадцатого века. Ренате Гирмес обосновывает, почему образовательные учреждения должны быть задуманы как ‚общины‘, способствующие человеческому развитию. Она обсуждает аргументы для нового взгляда на задачи системы образования с точки зрения традиционного христианского мышления и рассматривает в этом контексте смысл и обетования крещения в их аргументированной опоре на Евангелие от Иоанна. Для этого разрабатывается толкование данной традиции, которое раскрывает, какие принципиальные сведения может дать библейский текст о формировании отношений поколений и каким связанным с этим вызовам противостоит профессиональная практика воспитания и образования. Определенным образом статья Мальгоржаты Шондер возводит тематический мост между первой и второй частью этого номера. Ее исследование вносит эмпирический вклад в вопрос о том, является влияние религиозности и религиозной принадлежности на чувство когерентности молодых людей в светской стране (на примере Германии) и в католической стране (на примере Польши). Под понятием «религиозность» были исследованы религиозные убеждения, организованная и неорганизованная религиозная активность. Посещение богослужения и религиозная принадлежность влияют на чувство когерентности польских студентов сильнее, чем на немецких студентов. Герберт Ассельмейер излагает идею и концепцию образовательных регионов, при которых школьные объединения являются важным вкладом, потому что здесь речь идет о единственном организационном типе, который является обязательным к посещению. Образовательные регионы могут быть сетью потенциалов отдельных педагогических учреждений, чтобы благодаря этому эффективнее оказывать помощь в обнаружении и раскрытии дарований и талантов. Коммуны являются «настоящими местами обучения для детей и взрослых». Статья Надин Комес информирует о результатах квалитативного исследования темы отрицательного образовательного опыта в освоении языка детьми от двух до шести лет в берлинском двуязычном немецко-французском детском саде. Автор объясняет, как исследованный «негативный опыт» был связан с существованием языка-посредника детей и причислен к трем заранее определенным компетенциям. Александр Я. Данилюк и Алла А.Факторович описывают «смысл» как основополагающую педагогическую категорию. Они анализируют различные определения понятия «смысл», отделяя его от «значения» и похожих понятий. «Смысл», «смыслосфера» и т.д. образуют действительное содержание образования, который состоит из осознанной, свободной деятельности должен стать ключевым элементом содержания образования. Авторы понимают сложности адекватного перевода центральных понятий в содержательном контексте данной статьи и заинтересованы в критико-конструктивной дискуссии данной терминологии. Мы просим авторов последовательно соблюдать наши инструкции по оформлению: Instructions to contributors (!) и присылать статьи в редакцию для публикации в номере 3-2017 до 31-го августа 2017 года. IDE publiziert sowohl thematisch gebundene Ausgaben als auch solche, in denen nur der Titel des Journals die einzige Orientierung ist für die Untersuchung pädagogischer Erscheinungen aus historischer, internationaler und vergleichender Perspektive. In dieser Ausgabe haben wir einen Mix aus thematisch orientierten und thematisch offenen Beiträgen. Das Erstgenannte bezieht sich auf das 500. Jahr der protestantischen Reformation und Aspekte der gegenwärtigen Reflexion. Im Verlauf der Zeit hat man sich aus unterschiedlichen Weltsichten mit dem pädagogischen und bildungspolitischen Erbe der Reformation beschäftigt. Hinsichtlich solcher Beiträge werden in unserem Journal keine speziellen religiösen, wissenschaftlich-theoretischen, oder forschungsmethodischen Orientierungen favorisiert. Wir unterstützen die Position, wonach das 500. Jahr der Reformation nicht deklariert wurde als ein Jubiläum innerhalb protestantischer Zirkel und nicht nur auf Luther konzentriert sein sollte (Käßmann, 2016). Die Reformation war eines der weltweit größten historischen Transformationsprozesse und wurde aus unterschiedlichen Standpunkten dargestellt: aus religiösen und nicht-religiösen, ökumenischen und weltlichen, mit und ohne Versuche einer Vereinnahmung. In Ergänzung zu Luther muss Philipp Melanchthon (1497-1560), der „Praeceptor Germaniae“, erwähnt werden. Besonders außerhalb Deutschlands ist seine herausragende Bedeutung für die Reformation und ihre daraus resultierenden Entwicklungen im Bildungsbereich wenig bekannt. Auch mit dieser Ausgabe können wir noch keinen besonderen Beitrag zu einer angemessenen Beachtung von Melanchthon leisten, hoffen jedoch, im Rahmen einer der nächsten Ausgaben etwas mehr dafür tun zu können. Am Beispiel der Reformation lohnt es sich, herauszufinden, in welchem Grad man aus der Geschichte lernen kann. Können Diskussionen über führende Repräsentanten der Reformation und die von ihnen initiierten Reformen sowie ihre Irrtümer und Haltungen gegenüber anderen christlichen Bewegungen oder auch nicht-christlichen Glaubengemeinschaften (z.B. die Juden) nützlich sein für ein tieferes Verständnis gegenwärtiger Probleme und deren Lösung? Es geht darum, so viel wie möglich über die Geschichte zu wissen, um eine Perspektive über dem Wirken des Augenblicks zu gewinnen (Diesterweg, 1956, S. 205). In anderen Worten: “Wer sich nicht an die Vergangenheit erinnern kann, ist dazu verdammt, sie zu wiederholen.” (Santayana, 1905, S. 284). Historisches Wissen kann helfen, das Böse nicht zu wiederholen, Empathie mit Menschen aus anderen Kulturen und anderen religiösen Identitäten zu entwickeln sowie ethno-zentristische Sichtweisen zu überwinden. Der erste Teil dieser Ausgabe wird eingeleitet mit einem Beitrag von Gottfried Orth zu Luthers Rede über Gott in einer Zeit der frühkapitalistischen Zivilisation. Der Verfasser umreißt z.B. Luthers diesbezügliche Überlegungen und fragt nach zeitgemäßen gesellschaftlichen, kapitalismuskritischen Perspektiven sowie nach einem Gottesverständnis in Richtung von Luthers Theologie, welches gegenwärtige Glaubensorientierungen in der Auseinandersetzung mit ökonomischen und gesellschaftlichen Entwicklungen positiv begleiten kann. Hein Retter analysiert ausgewählte Publikationen über Luther und die Reformation bei besonderer Beachtung aktueller Positionen von Historikern, Kirchenhistorikern und Schriftstellern. Er konzentriert sich auf Luther-Darstellungen im Zusammenhang mit dessen Wurzeln im Mittelalter, den herausragenden Leistungen der Reformation in Wort und Bild, der Luther-Kritik aus nachchristlicher und katholischer Sicht und der Zukunft der Kirchen. In seinem Beitrag zeigt Gerd Biegel ein Beispiel dafür, dass die Reformation eine sehr heterogene Bewegung war, mit verschiedenen regionalen und lokalen Ausprägungen und Entwicklungen. Er rückt Namen wie Johannes Bugenhagen (1485-1558), Gottschalk Kruse (1499-1540) und Heinrich Lampe (1503-1583) in den Blick, die heute weniger bekannt sind, ohne deren Aktivitäten aber z.B. der Reformationsbeginn 1528 in der Stadt Braunschweig kaum denkbar gewesen wäre. Anja Franz & Dietrich-Eckhard Franz beschreiben bedeutende soziale Utopien im Kontext des Bauernkrieges und der Luthrischen Reformation. Es geht um Thomas Müntzer (ca. 1489-1525), Michael Gaismair (1490-1532) und Johann Hergot (1522-1527). Die Autoren konstatieren, dass Martin Luthers 95 Thesen die Reformation initiierten, aber durch Müntzer und andere Utopisten die Reformation alle Schichten der Gesellschaft erfasste. Viele ihrer gesellschaftskritisch-utopischen Schriften wiesen in ihren Aussagen und Forderungen weit über die bestehenden sozialen Verhältnisse hinaus. Im Fokus eines weiteren Beitrages von Hein Retter steht die Frage der Toleranz und Intoleranz in der Zeit zwischen Reformation und Aufklärung sowie im Kontext der katholisch-protestantischen Aufspaltung. Ergebnisse einer internationalen Konferenz, die der Autor präsentiert, zeigen, dass Toleranz im Zeitalter der Reformation nicht verwechselt werden sollte mit gegenseitiger Anerkennung religiöser und kultureller Eigenart, wenn es um das Eintreten für eine friedvolle Koexistenz differenter Gruppen in einer pluralistischen Gersellschaft geht. Mit ihrer kunst- und literaturgeschichtlichen Abhandlung bringen Richard D. Scheuerman & Arthur K. Ellis eine neue thematische Richtung und mit den Abbildungen auch eine optische Bereicherung in unsere Zeitschrift. Die Autoren beschäftigen sich mit der Darstellung von “House Fathers” und “People of the Fields” in der Kunst und Volksliteratur seit der Reformation. Das Verhältnis der Menschen zur Natur im Kontext des technologischen Wandels durch die industrielle Revolution wurde in der früh-modernen deutschen und österreichischen Kunst und Literatur oft mit Ideen der protestantischen Reformation verbunden. Nachhaltiger Umgang mit der Natur war bereits eines der Anliegen dieser Künstler und Literaten des 19. Jahrhunderts. Renate Girmes begründet, warum Bildungseinrichtungen als menschliche Entfaltung tragende ‚Gemeinden’ gedacht werden sollten. Sie erörtert Argumente für einen neuen Blick auf die Aufgaben des Bildungssystems aus der Tradition christlichen Denkens und betrachtet in diesem Kontext Sinn und Verheißung der Taufe in deren argumentativer Stützung auf das Johannesevangelium. Dazu wird eine Lesart zu dieser Tradition entwickelt, die klären kann, welche grundsätzliche Auskunft der biblische Text über die Gestaltung des Generationenverhältnisses zu geben vermag und welchen damit verbundenen Herausforderungen eine professionelle Erziehungs- und Bildungspraxis gegenübersteht. In gewisser Weise baut der Beitrag von Malgorzata Schonder eine thematische Brücke zwischen dem ersten und dem zweiten Teil dieser Ausgabe. Ihre Untersuchung leistet einen empirischen Beitrag zu der Frage, ob der Einfluss von Religiosität und Religionszugehörigkeit auf das Kohärenzgefühl junger Menschen zwischen einem säkularen Land (wie Deutschland) und einem katholischen Land (wie Polen) unterschiedlich ist. Unter dem Begriff „Religiosität“ wurden religiöse Überzeugung, organisierte und nicht organisierte religiöse Aktivität untersucht. Gottesdienstbesuch und Religionszugehörigkeit beeinflussen das Kohärenzgefühl polnischer Studierender stärker als dasjenige der deutschen Studierenden. Herbert Asselmeyer erläutert die Idee und das Konzept von Lernregionen, zu denen die Schulnetzwerke einen wichtigen Beitrag leisten, weil sie die einzige Art der Organisation mit obligatorischer Immatrikulation sind. Lernregionen können ein Netzwerk potenzieller individueller pädagogischer Institutionen sein, um zu helfen, Begabungen und Talente noch effektiver zu entdecken und zu erweitern. Gemeinden sind “die wahren Lernorte, für Kinder und Erwachsene”. Der Beitrag von Nadine Comes informiert über die Ergebnisse einer qualitativen Studie über negativ-formative Erfahrungen im Spracherwerb von zwei- bis sechsjährigen Kindern in einer zweisprachigen deutsch-französischen Kindertagesstätte. Die Autorin erklärt, wie die untersuchten “negativen Erfahrungen” mit der Existenz einer internen Sprache Lernender verknüpft und mit zuvor definierten Kompetenzfeldern ausgerichtet waren. Alexander J. Daniliuk & Alla A. Faktorowitsch beschreiben den “Sinn” als eine grundlegende pädagogische Kategorie. Sie analysieren verschiedene Definitionen des Begriffs “Sinn”, indem sie ihn von “Bedeutung” und ähnlichen Begriffen trennen. “Sense”, “Smyslosfera” (смыслосфера, Sinnsphäre) bilden den wirklichen Bildungsinhalt, der aus bewussten, freien Aktivitäten besteht und zu einem Schlüsselelement des Bildungsinhalts werden sollte. Die Autoren sind sich der Schwierigkeiten bewusst, die zentralen Begriffe des Artikels adäquat zu übersetzen und sind an einer konstruktiv-kritischen Diskussion ihrer Terminologie interessiert. Autorinnen und Autoren werden gebeten, unsere Instructions to contributors (!) zu beachten und ihre Artikel für die Ausgabe 3-2017 bis zum 31. August, 2017 an die Redaktion zu schicken.